Firstshowz brings you NTR starrer Jai Lava Kusa Movie Review this week. The much awaited movie is all set for grand release today and creates record openings so far. Jai (NTR), Lava (NTR), Kusa (NTR) are three brothers who are famous for their drama acts. Jai who has disability of stammering is ignored for the stage acts with Lava and Kusa . Jai who feels as this as a disappointment sets stage into fire. Disappointed Jai will transform himself into Raavana and this is the time where Lava and Kusa will bond after 20 years. How Raashi Khanna and Nivetha Thomas is connected to the story and how three brothers patch up for a good cause is the rest of the story. For the first time, NTR will be seen in triple role and the actor performs with ease in the roles of Jai Lava Kusa. NTR’s all-rounder performance will surely make audience enthral with his energy in emotions, dances and action with fun filled ride. Raashi Khanna and Nivetha Thomas justify their roles with extra added glamour. Tammana sets fire with his sizzling special song Swing Zara. Sai Kumar and Ronit Roy excelled in thier roles. Abhimanyu Singh and Posani Krishna Murali are good in their roles. Music Director Devi Sri Prasad scores intensive response from his background score. His Album is already proved its stamina in Audio Market with positive vibes. The writing department though projects routine story the screenplay and narration is at top notch by Director KS Ravindra (Bobby). Production Values by NTR Arts is rich. 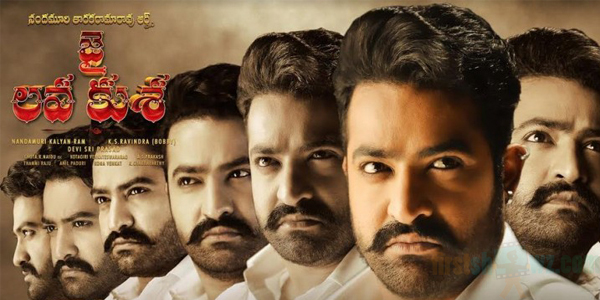 Jai Lava Kusa is all about three brothers who have their unique image. Jai who lost himself in Raavana Image will be separated and Lava Kusa will bond together along with his uncle. The love chemistry between NTR and Raashi Khanna is OK and Nivetha Thomas with NTR scenes will thrill.